After a long weekend of indulging in rich food I need a week of eating humble, simple, and comforting food. I need to be comforted because the day after Thanksgiving it always dawns on me that it’s almost Christmas, and now I’m in panic mode because I haven’t even thought about decorating, I don’t know what gifts I’m getting for anyone, there is Christmas baking to be done, and recipes to be posted…Aaaargh! You’d think that I’d have learned by now to get ahead of the game! Panic is the curse of the procrastinator! Comfort food for me is chocolate or pasta, and since I only eat chocolate for dinner when Billy is on the road, it’s got to be pasta when he is home. This pasta is both light and hearty. Does that make sense to anyone else? 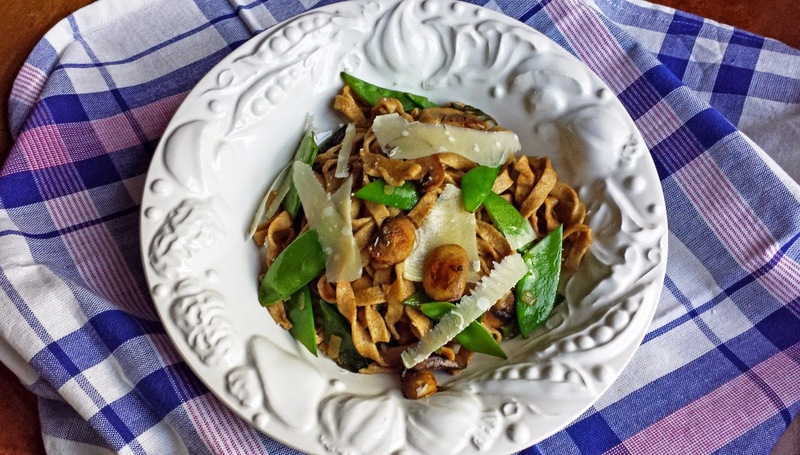 Snow peas are sweet and crisp which keeps the dish feeling light, mushrooms are just the opposite and opposites do attract! Whole grain pasta is denser than regular pasta, which makes the dish hearty. 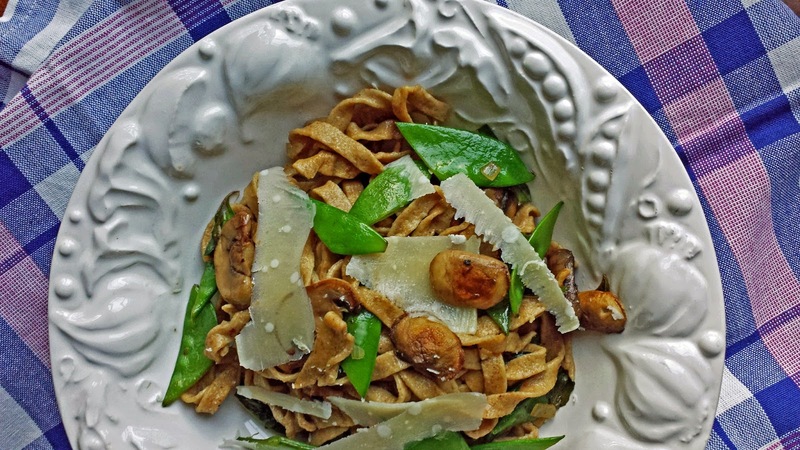 Sesame oil and parmesan cheese give the pasta a nutty flavor and gives it balance. I had leftover Homemade Spelt Pasta which I rolled and cut into fettuccini, but packaged pasta would work well too. Now you’ll have to excuse me, cuz I stayed away from anything resembling a store this weekend, which means that I still haven’t done a thing for Christmas, to quote Scarlett “I can't think about that right now. If I do, I'll go crazy. I'll think about that tomorrow.” Right now I’ll just curl up in a ball and be comforted by a giant bowl of Mushroom & Snow Peas with Whole Grain Pasta! 1. Cook the pasta according to either the recipe for fresh pasta or the package directions, remember to cook the pasta just under al dente, because it will finish cooking with the mushrooms and snow peas. Drain the pasta reserving some of the pasta water for the sauce, about ½ cup for boxed pasta, or up to 2 cups for fresh pasta. 2. Meanwhile; heat a large skillet over medium-high heat. Add the mushrooms and grape seed or canola oil to the hot skillet, cook for about 3 minutes until the underside is golden brown, turn the mushrooms over and add the snow peas, shallots and salt & pepper. Cook, stirring occasionally for about 3 minutes longer, until the mushrooms have browned, and the snow peas are tender crisp. 3. Add the cooked pasta to the pan along with about half of the pasta water to begin with, stir continuously; season with toasted sesame oil and more salt & pepper to taste, add more of the reserved pasta water if the pasta seems too dry. Serve with parmesan shavings, or freshly grated parmesan. Note: Really you may use any pasta that you like; I just used whole grain in an effort to make the dish a little more nutritious. Ya, I love mushrooms too Shea! 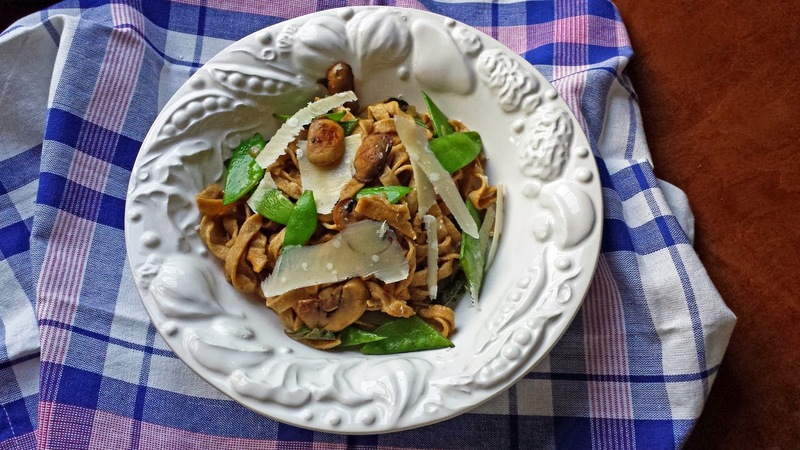 I love mushrooms, but really like the idea of adding snow peas. It really is a good combo. I'll be trying to sneak lots of healthy stuff in between all the Christmas & holiday parties. You could add some sliced chicken or pork instead of the mushrooms, I do feel like it needs something savory. I just love whole grain pasta. This is a must try for dinner. I hope you do Jocelyn!